Some of you know that I have been researching and writing about Boston's historic Parker House since the early 1990s. Or that in 2012 I was made the hotel's official House Historian. You'd think that I'd be done by now, but no: It seems like there are always new facts to discover, new stories to tell, and new images to share. And that's why I'm so excited about this new, updated and expanded version of our book, Heaven, By Hotel Standards. As Boston's oldest continuously operating hotel (established in 1855 by Harvey Parker of Maine), the Omni Parker House has played an integral part in the history of Boston. In the culinary world, it's been heralded as the home of the Parker House Roll and Boston Cream Pie — and a place where Ho Chi Minh, Malcolm X, Emeril Lagasse, Jasper White, and Lydia Shire once worked in the kitchens. The Parker House was where the brightest lights of America's Golden Age of Literature — writers like Emerson, Hawthorne, Holmes, and Longfellow — regularly met in the legendary Saturday Club. At the Parker House, baseball greats like Babe Ruth, Ted Williams, Carl Yastrzemski, and David Ortiz wined, dined, and unwound, while generations of local and national politicians — including every U.S. President from Ulysses S. Grant to Barack Obama — assembled for private meetings, press conferences, and power breakfasts. Did Charles Dickens practice his first American reading of "A Christmas Carol" here? Of course! Was the door to Dickens' suite removed by a workman during the demolition of the old Parker House, only to be unexpectedly returned to the new Parker House 90 years later? Indeed. Did John Wilkes Booth do pistol-range practice right next door while a Parker House guest? You bet. Was our nineteenth century French chef, Augustine Anezin, one of the most heralded culinarians in America? Mais oui. Did actress Sarah Bernhart get bounced from the premises because she wanted to lodge here with her 5-foot long pet snake? C'est vrai. Did Jack Kennedy make his formal marriage proposal to Jaqueline Bouvier at Table 40 in Parker's Restaurant? Of course. And did movie and TV star Cybill Shepherd get mistaken for a concierge by a guest couple, then proceed to confirm their airplane bookings without batting an eyelash? It's true. But there's no need for me to tell all this to you now ... since it's in the book. Pick up a copy. And I think you'll enjoy the journey as much as I have. — "Heaven by book standards. Love the history." — "I especially liked the way you made it a book about the city's history as well as that of the hotel." 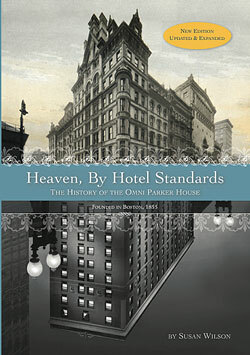 — "Heaven, By Hotel Standards is a gem: elegant, lively, and packed with Boston history. I'm truly impressed." — "The Parker House book is magnificent — visually — and photos and text. All so entertaining. And I love all the colors and the quality of paper and the size, etc. Full of facts and smiles and life." — "As a travel and history columnist, I often have to turn to books for research, but it isn't always a safe endeavor. There are many books out there that are stylized to the point of falsity. Finding a balance between making history entertaining rather than dry and keeping things factual is tough. This is where Wilson shines. … She must have dug very deep to get all of the information she imparts here and I am more than happy that she did."